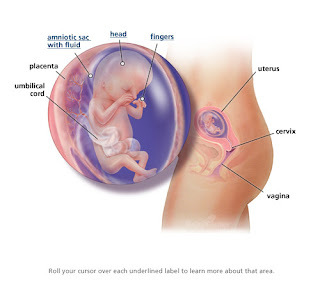 By the end of pregnancy week 13, our baby looks like a tiny yet fully formed baby. While our baby's head is still quite large, his body is starting to catch up. Our baby's eyes are starting to move closer together by pregnancy 13 weeks. Up until this point in time, they rested closely along the sides of the head. Our baby's intestines are also moving further into the body, and our baby's tiny pancreas is starting to produce insulin, which will be vital for regulating your baby's sugar levels later in life! Fingerprints have formed on our baby's tiny fingertips, her veins and organs are clearly visible through her still-thin skin, and her body is starting to catch up with her head — which makes up just a third of her body size now. If we're having a girl, she now has more than 2 million eggs in her ovaries, but what about if we're having a boy? :) Our baby is almost 3 inches long (the size of a medium shrimp) and weighs nearly an ounce.